A government special agent known only as the Signalman gets off a train on a stunningly hot morning in Winslow, Arizona. Later that day he meets a woman in a diner to exchange information about an event that happened a week earlier for which neither has an explanation, but which haunts the Signalman. In a ranch house near the shore of the Salton Sea a cult leader gathers up the weak and susceptible — the Children of the Next Level — and offers them something to believe in and a chance for transcendence. The future is coming and they will help to usher it in. A day after the events at the ranch house which disturbed the Signalman so deeply that he and his government sought out help from 'other' sources, Johns Hopkins Applied Physics Laboratory abruptly loses contact with NASA's interplanetary probe New Horizons. Something out beyond the orbit of Pluto has made contact. And a woman floating outside of time looks to the future and the past for answers to what can save humanity. 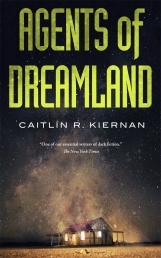 Agents of Dreamland is a new Lovecraftian horror novella from award-winning author Caitlín R. Kiernan.